The total trade volume between Qatar and Malaysia saw a 23.3% growth to reach $340.4mn from January to July 2018, according to figures from the Malaysian embassy in Doha. Speaking to reporters Wednesday on the sidelines of a business meeting held at Qatar Chamber, ambassador Dato Ahmad Fadil Shamsuddin said Qatar is Malaysia’s third largest trading partner in GCC countries. “The trade was in favour of Qatar since 2013. Total trade was seen to pick up in 2017, registering a growth at 18%. It was supported by an increase in Malaysian exports to Qatar amounting to $178.2mn and imports reaching $494.1mn in 2017,” Shamsuddin said. The ambassador said trade and investment remain as “the major cornerstone between Malaysia and Qatar.” “Our countries need to further take advantage of the positive momentum to enjoy and benefit from the prospect of vibrant business partnerships,” Shamsuddin pointed out. 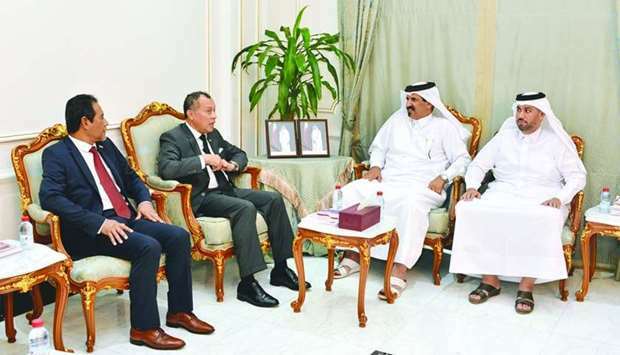 During the meeting, Shamsuddin accompanied Malaysia External Trade Development Corporation (Matrade) deputy director of Customised Section Md Zainuddin A Jalil, who met with Qatar Chamber first vice-chairman Mohamed bin Towar al-Kuwari. Jalil led a delegation comprising Malaysian companies Oilfield Technical Inspection, Eureka Effektif, Mutiara Teknologi, Meditech Gloves, HLM Wood Products, Ana Muslim, and VI Academy. The ambassador said the Malaysian delegation is set to offer products and services on security hardware and integration services, wooden flooring, floor and wall tiles, latex and synthetic surgical gloves, school merchandise and children’s apparel, and education and training services. “We are here to offer our best expertise in parallel with the Qatar National Vision 2030 where we’re ready to collaborate with Qatar businesses in developing the industry together. “Qatar is one of the leaders in oil and gas, and we bring high-class expertise in non-destructive testing and pipeline inspection and integrated solution to collaborate with industries here,” Jalil said. Jalil also stressed that Malaysia is interested to deepen economic and trade relations with Qatar, adding that Malaysian companies “highly-welcome” the establishment of partnerships with Qatari companies. He also said Matrade and the Malaysian embassy are set to organise business meetings with major companies in related sectors, as well as ‘chain sessions’ with related ministries, authorities, and associations in Qatar. According to al-Kuwari, Qatar Chamber is interested to enhance co-operation ties of both countries’ private sectors in the fields of trade, investment, technology and services, and other economic fields. “Malaysia is one of the most attractive investment destinations for Qataris. Qatari businessmen are eager to explore the investment opportunities available in the Malaysian market. “There are a multitude of Malaysian companies operating in Qatar in various sectors including infrastructure, engineering, construction, oil and gas services, decoration, exhibitions, conferences, and technology,” said al-Kuwari, who added that Qatar Chamber and the National Chamber of Commerce and Industry of Malaysia signed an MoU on the sidelines of the Qatari-Malaysian Economic Forum held in Kuala Lumpur last year. MSS Teknologi (M) Sdn Bhd. Mutiara Towertech (M) Sdn. Bhd. Innovative Oilfield Solutions (M) Sdn. Bhd. Mutiara Synergy Resources (M) Sdn. Bhd. This site can be navigated using the desktop and smartphones. Best viewed with minimum resolution of 1920x1080. Mutiara Teknologi (M) Sdn Bhd will not be responsible for any damage or loss caused by the use of the informations in this site. All informations displayed is true and correct at the time of the date and time of publications and subject to revision from time to time. Copyright 2019 Mutiara Teknologi. All Rights Reserved.